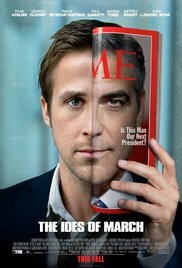 “The Ides of March” is a well-imaged documentary about the race to presidency in the US. Personally, I think this film is far from being a thriller. It simply shows that a president should be a charismatic, intellectual, verbose guy with a Colgate-smile guy with a well-oiled entourage behind him. This PR department is concerned with manipulating the press and important people. And they search for dirty little secrets from opponents. And that’s about it what’s being showed here! They did gather a very strong cast with Ryan Gossling as the central figure. He plays his role as a cunning campaign employee for Mike Morris (George Clooney). Mike is a man who will never win a gold medal in the category “honesty”. Evan Rachel Wood takes care of the idyllic romantic part on one side and of a scandal along the other side. Gosh, who could have thought that. Personally I thought Philip Seymour Hoffman and Paul Giamatti were the most convincing actors in this film. Ryan Gossling is also such a person who dabs his face in stiffness before appearing in a scene. Whether that guy is sitting behind a steering wheel, playing a gangster or a serious assistant of a politician. He always puts on a poker face so you can’t tell whether he has a Royal Flush or he’s bluffing. Hoffman and Giamatti have the characteristic of a chameleon, so they can transform themselves into another form each time. And they both play in such a natural way! George Clooney plays on autopilot and actually has a limited contribution in this film. Until the end of course. For the rest, he looks again like the ideal son-in-law / husband with his slick appearance, his disarming smile and his everlasting charm. And in the end he’s still a scammer and trickster. This time it’s not a casino owner who’s the victim, but his wife. Politics for me is a source of annoyance in real life. Most of the time it gives me chronic diarrhea. Let alone this is also used in a film. In other words, this isn’t exactly my favorite type of movie. Nevertheless. I must admit that this film kept me awake. And I didn’t have to take any kind of effervescent tablets afterwards because of a splitting headache.